It's day two of RC2-Feta, which has been soaking politely in the fridge for two days, so plans for dinner include a nice salad with feta! Before I rinsed it, J tried it out. I like the thyme, he said. It's a little softer than I expect feta to be. So I wasn't worried. This stuff was been overly wet this entire time (partly due to the use of 2% milk, I've theorized), and it was only going to get wetter. I rinsed the cheese maybe 5 times before I tried it for myself. Oh. My. Have you ever opened your mouth while swimming in the ocean? That taste dissipated long before this one will. Seriously, I've tasted olive brine less salty than this cheese. I had the feeling that J's eyes were saying more than his mouth, but I hadn't realized that was I just spontaneously dehydrated. I can't remember when I laughed so hard. I just stood over it, watching the cheese blobs bob in the strainer, and laughed and laughed. I'm a little disappointed, but I still made cheese and that makes me happy. Feta-1 is soaking in plain water in the fridge, but I'm thinking we'll just move on. I'm thinking mozzarella next. So I ended up with so much whey from RC2WR1 that I wanted to see if it had a RC2WR2 in it. If you like the smell of warming cheese water (which I do) then this experiment was a win. If you were hoping for more cheese (which I was, despite everything all research has indicated), then science won. I won't say that I failed, because that is negative thinking. Basically, no cheese was created or collected, so I ended up with the same amount of ricotta whey that I started with. But I hope I didn't make the whey into something completely different, like lemon blob water. At least it's in a different jar now. Why-o-why did I choose a lemonade bottle to store the whey in?! We're the only people in the city sniffing our lemonade. It's like a prank I played on myself, and the eager scrawl of "WHEY!" in Sharpie on the side isn't adding any class to the situation. So I'd better try this whey-ricotta thing. The Junket rennet came with instructions on how to make whey-ricotta, but it basically entails letting the whey sit in a pot overnight. I've just watched a pot sit for like days, thank-you-very-much, so that doesn't sound very exciting. As I recently explained to Mom, I just don't agree with the Doctor. I'm going to do it the way I always do it! Happily, before I proceeded with my usual china-shop care, I revisited the whey-ty page I mentioned earlier, Fias Co Farm. Sounds like our kind of place, right? The post I've linked to explains the science behind this whole process, so please take the time to check it out. For my purposes, her whey-ricotta recipe was perfect for RC2WR1. Since the recipe doesn't require a set amount of whey, and only suggests the use a small amount of vinegar, this seemed like a great, fun, quick way to use off the whey. I let it sit out at room temperature (I ended up with about 5½ cups from the cheese...there was probably a total of 8 cups at one point, but what can I say? the rest got awhey from me) while I washed the big pot for the ten-millionth time this week and sterilized it by boiling a small amount of water for five minutes. Why not? I do have plain vinegar in the house, but I'm thinking it's at least three years old by now (just like Allen! oh dear I think we had it at the old place, so it may be more like Walt's age...) so I had a lemon (and it's strainer) at the ready. It took about seven minutes for the whey to reach 200 degrees...it was admittedly awesome to watch it "cream up." It's a small miracle, like witnessing egg whites whip, but your arm doesn't hurt. I did end up adding about 1 Tb of lemon juice, just because. I think it helped. It strained beautifully, but RC2WR1 is an it-bit at an 1/8 of a cup (at best!). Rennet cheese #2 is officially Feta cheese #1! Except for a little bit that I saved to crumble on something. Pretty sturdy stuff; looks just like the real thing! Now we just have to wait for the feta to pickle for a couple of days. The brine was 2.5 cups water and about 5 Tbs of salt (per the good Dr.'s recipe), plus the English thyme I added. Now everytime I open the fridge I sing to myself, Pickle away, little dudes! Pickle away! That worked for the carrots. As Lao-Tse supposedly said, "The more you know, the less you understand." I'm thinking he meant that in the best possible way; and I'm also coming to it as a person who is satisfied with fairly superficial scientific knowledge. But I continue to be increasingly struck by simple chemistry and biology. A yard speckled with dandelions is a salad-in-the-making; cheese by-product (whey) is a bit of a miracle liquid; anything that can be classified as a fruit will at least feed something, even if you don't want to eat it. For example, I've officially given up on trying to harvest our black walnuts, happy to feed the squirrels. And I haven't picked the dandelions because no amount of scrubbing will take away the image of the dogs peeing on them. But I'm not satisfied with just using whey for watering our precious plants or feeding our pig-puppies. Whey from rennet cheese can be used to make ricotta (I can't wait! And then can I can cook with that whey! ), but otherwise it can replace water for lemonade (which we haven't tried, but correctly-drained whey does look like lemonade, which is why it's mean to store it in an empty lemonade bottle) or broth in rice or potato risotto (when I made the former I poached chicken in the whey and used the resulting broth for the rice and shredded the chicken for enchiladas the next night), etc. Using it to cook with (as in deglazing) adds a sort of creaminess, I mean the -ness without the cream. You just have to try it! Rennet cheese #2 is resting peacefully in the fridge and I've finally rinsed the milk smell out of the kitchen, so this seems like the perfect time to share the simple, no-rennet cheese that started all this (referred to here loosely as "ricotta" or "queso fresco" or, to an even looser extent, "paneer"). I live in house full of reference books and have the endless wisdom of the Internet at my fingertips, but being me I went in for simplicity. If you get the cheese bug (the good kind, not that really awful kind) you might want to do the kind of exhaustive research I did. I also recommend the good Dr.'s site and this whey-ty page. Here's the basic recipe, blogged with enviable skill by Little House in the Suburbs (check it out). Just bring milk to a boil (around 180-200 degrees F), stirring occasionally to break up the film that forms. The first time I did this, I heated the milk very slowly. Now I just pump up the heat and watch it. Happens fast! Go back in time and set up a colander, covered with more cheesecloth than you think you'll need, over a large bowl (to catch the whey). We found cheesecloth at Giant and Williams & Sonoma. I've also seen that you can use any cotton item, as long as it's well-washed (maybe boiled) and not treated with any product (you don't want Bounce cheese). Slowly pour the curded milk into the colander. 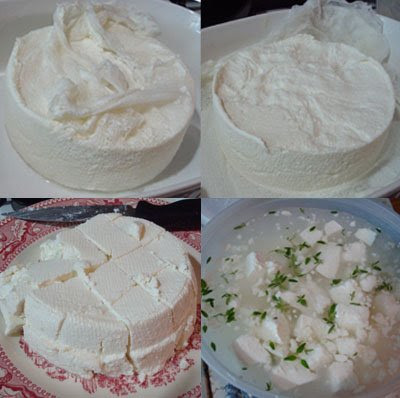 If you luck out and get large curds, use a slotted spoon to remove the big pieces first, then pour in the rest. I found that goat milk (ultra-pasteurized) didn't strain very quickly. Let it sit in the colander for up to a few hours, until it isn't liquidy anymore. This step is similar to draining the rennet cheese. The goat-cheese tastes really authentic; we've found goat milk at Trader Joe's and Fresh Market. Once the cheese is fairly thick, fold up the sides of the cloth so that you have a little package of cheese; tie a string around the top of the cloth, making a ball, and hang it over the sink for a few hours. As long as you can suspend and drain the ball somehow, you can store it anywhere, including the fridge. Put the whey in a clean jar and refrigerate for later use (which I'll be posting on shortly). You should now be experiencing what I (and only I) like to call "cheese-phoria": a sublime feeling that you have just sweet-talked nature. Oh, and just think of all the things you can stuff cheese into. The second night of rennet cheese #2's life will be spent in a cheese press. The good doctor recommended a tin can, but as I was rummaging through the pantry for a big enough can, J suggested the little heart-shaped bunt pans we bought for Valentine's Day some years ago. Perfect! They come with a built-in top to press down on. See, you need a medium-sized, smooth-sided, open-ended container to serve as the press. You put something on the top to press it down. And then I found it: The top of an old blank-CD carousel. You know the ones. I cut off the plastic top (it was made of pretty sturdy plastic let me tell you) and voila! I bet it's one of the more interesting stories of CD packaging. And then I found that I didn't have as much loose change as I thought...which was what I'd planned to use as the weight. The heaviest object I could find was the brass camphor holder we got in Bangalore. As always, Ganesh comes to the rescue! Aunt Cookie just made me wonder why I was so suddenly drawn to this whole cheese-making thing: I do have diary farming in much of my ancestry. I remember stories of selling milk to the Gilman dairy and getting the resulting whey for free. Made fat pigs, apparently. But now I'm thinking that maybe I'd be better at actual milking rather than the cheese-making. Or possibly cow-chasing. I'm not afraid of cows anymore! If you walked into our kitchen right now, you'd immediately notice — other than the pot that says "I have cheese in me / No whey!" and the bowls of draining cheese and the cheesecloth drying on the cupboard handles — a bag of water hanging over the sink. The only places I've ever heard of that do this are a venta on the way to Sevilla and a restaurant in New Mexico that my folks went to. Both had bags of water hanging around "for the flies." Sounds weird, but it seems to work. And I swear that there haven't been any flies around the cheese since I hung up that bag. Baby, you're so patient! Day two of Rennet Cheese #2: so far, so curd! So around 10 this morning I tested our rennet cheese #2, a mixture of heated milk, live yogurt and rennet, which had been sitting overnight. I could really feel the curd; it kind of had the consistency of yogurt pie, the kind you add gelatin to. I was able to slice it, but the curds kind of fell apart. Then I was supposed to mix it by hand for 15 minutes, and by the end of that the curds were really small, like when I make ricotta (well, at least when I make ricotta; some stuff I've read indicates I should get larger curds). In the top-left picture, you can see some curds left in the pot. It kind of looks like thick yogurt right now. I actually ended up twice-draining the whey; in these photos you can see how milky the whey is, but once I re-strained the whey itself it looks like we're getting a good clear liquid. From which I'll make ricotta! So excited! But first I need to let the cheese drain for a couple more hours before I can put it into the cheese-molds. We'll certainly get plenty of product; the bottom-right photo shows the mock-colander (actually the potato ricer) I had to fashion because my other colander wouldn't hold all the cheese! So I knew this cheese-making thing would be worth it once I saw the box the rennet tablets come in. It's so adorable you can't stand it. Really classic. 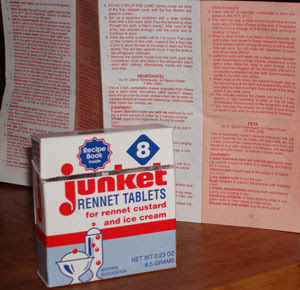 Apparently, Junket rennet tablets have been around forever and has its own little advertising legacy. There's a very comprehensive recipe booklet included (great example of one-color printing, too!) with regular-guy instructions by one Dr. David Fankhauser. Being a doctor, he realizes that if I'm making my own cheese in 2009 then I probably can't afford a fancy cheese-press and so suggested a tin-can version. Wait till you see what we've decided to use! Best yet, most of the recipes don't require a 6-month resting period. So we're starting with feta, which only takes four days. My only complaint is that all the recipes require half a tablet. Why not just make the tablets smaller? Or is there a camera in the box so that the Junket people can laugh at my sending half a tablet across the kitchen counter under my knife? I bet it was pretty funny, though. What the heck is rennet anyway? This is an excellent question, and in the interest of blissful ignorance I've chosen to believe it's a magic cheese-making pill that comes packed in foil in a little box. After a couple of great batches of ricotta, I wanted to make some other cheeses but all the recipes I could find required (at the very least) something called a rennet tablet. So the next time we were at our local Giant I asked about it; You can make your own cheese? Ask Trader Joe's, they said. So the next time we were at our local Trader Joe's we asked again. They said, Nobody bought it. Try Whole Foods. So at this point I called Whole Foods. The woman I eventually reached immediately knew what I wanted and also had this answer: No, we certainly don't carry anything like that. Try Wegman's. And, can you believe it, the guy at Wegman's said, Why yes. In Aisle 15B. By this time I had read several rennet cheese recipes and was beginning to wonder at the wisdom of storing cheese for 6 months (which seemed to be the usual resting time for hard cheese) in my lovely yet life-prone kitchen. Happily, as we were shopping on this cool July 4th morning, we were completely detoured from our way home by a parade in Towson. So we ended up on the highway and J said, I think I know of a Wegman's around here. Long story slightly longer, I actually remembered the aisle number three weeks after calling and found the VERY LAST box of rennet they had, hidden with the gelatins. And only an investment of $1.67 for 8 tablets, cheaper than the milk! And so began this newest saga. 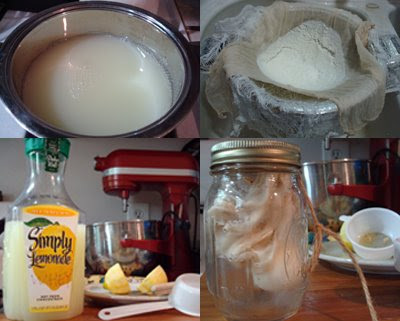 I now have a fresh gallon of 2% milk, some live & active yogurt, and brand-new cheesecloth. Off to rennet cheese #2! I halved the recipe. Never a good idea for these sorts of things, but I do it every freakin time. The splitting of the rennet tablet into fourths was not exactly mathematical. Some of the milk I used had pretty much embraced yogurt-dom before it sat overnight. But we won't give up! Let me tell you, however, that the taste of the sour cheese is not one I will forget. Ick. 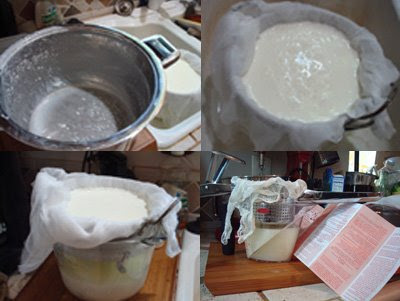 I first became interested in making my own cheese while watching foodnetwork. We still had last year's crop of Thai chili peppers and a whole new season about to burst forth, and I was on the look-out for different ways to use them (they pack quite a punch). That led me to a chili risotto...and somehow, due to whey I believe, I ended up looking for easy cheese recipes online. Milk? Lemon? Cheesecloth? I have those, I said (outloud, strangely, since I was alone), and next thing we know I've made "cottage cheese" or, as I prefer to call it, "ricotta." We then realized that this simple cheese is even more special when made with our fresh herbs. 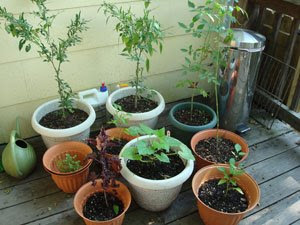 There's Thai basil (the purple stuff), cilantro, and a couple of cherry tomato trees in there too. And the leafy guy in the middle is zephyr squash — look for posts on that as summer progresses! Well, I am entering the blogosphere mostly in response to J's query, "are you facebooking your rennet experiments," posed during my morning general facebooking session. Oh that seems boring, I said. Ten minutes later I had created a blog, because who reads these anyway? I'm thinking it will be great fun — like cheese-making!